The period between Thanksgiving and Christmas is mixed bag of holiday films (Love, the Coopers), big-budget franchises (The Hunger Games), family films (The Peanuts Movie, The Good Dinosaur), and would-be Oscar contenders (Creed, Spotlight, Room). How refreshing for a film to come along that flips the traditional holiday fare on its nose and emerges as one of the most original films of the year. Indeed, it’s hard to believe the legend of Krampus has received sparse attention from major film studios (incidentally, an anthology called A Christmas Horror Story, starring William Shatner, was released earlier this fall, and Krampus figured prominently into one segment). So while the legend has seen some representation, Hollywood has not beat the premise to death. Yet. Krampus has been a part of Germanic folklore for decades. Krampus represents the antithesis of Santa Claus (think of God vs. Satan) – and he is summoned when an individual or a family loses their faith in the meaning of the Christmas season. Thus opens the story of Krampus, directed by Michael Dougherty (he directed the well-received 2007 horror film Trick ‘r Treat, unseen by me). The film opens with parents Tom (Adam Scott, late of NBC’s Parks and Recreation) and Sarah (Toni Collette, always great – it’s nice to see her in a leading role after a thankless walk-on in last year’s Tammy) are preparing for the arrival of Sarah’s sister Linda (Allison Tolman – you know her from FX’s first season of the Fargo adaptation) and her obnoxious family. Beth (Stefania LaVie Owen) is their teenage daughter Beth, and the film’s centerpiece protagonist is pre-teen son Max (convincingly played by Emjay Anthony of It’s Complicated and Chef). That great character actress Conchata Ferrell (Two and a Half Men) is a hoot as Aunt Dorothy, and she is the Gold Standard for comic relief. When Linda, her husband Howard (David Koechner of Anchorman and The Office), and their kids arrive, Max’s cousins humiliate him by reading a letter aloud to Santa to the other family members that Max has written. Angry and disillusioned, Max shuns the holiday. Almost instantly, the weather shifts into a bitter and cold blizzard, with a bizarre snowman appearing in the front yard. Soon the power is out, and Beth has gone missing in a futile attempt to reach her boyfriend. Something wicked this way comes – ya think? Eventually, Omi, Tom’s mother and the children’s grandmother, recounts her story of her family’s woes after World War II. They eventually turned their back on Christmas, and this summoned the demonic Krampus, who dragged her family and remainder of the town underground. Only Omi was spared, a painful reminder of what happens when the spirit of Christmas is dismissed. I won’t give any surprises here, but this sequence is so surprisingly fanciful and well done, I smiled through the movie. It felt positively animated. The family’s reaction to Omi’s story is logical and expected. What follows is the family’s attempt to escape the clutches of Krampus and his nefarious helpers. You may never think of gingerbread men cookies the same way again. 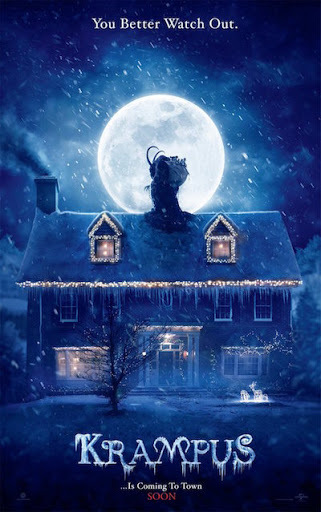 Krampus is wicked and twisted fun, with its tongue firmly in cheek. The horrors befalling the family are wisely managed with a great sense of humor. I am reminded of how I felt after seeing 2012’s The Cabin in the Woods. I didn’t always know where the story was going, but it was great fun getting there. This film is less violent than Cabin, and I wonder why the studio opted for a more “family friendly” PG-13 ratings vs. and R rating. However, I can’t imagine what parents would find this appropriate entertainment for any children in their family under the age of 13. I wish Dougherty had given us more close-ups of Krampus, which would have been truly frightening. But I guess this would tie in with the decision to keep the film from a more dreaded MPAA rating of R.
Finally, the film concludes as only it could, I suppose, but there is at least one more surprise in the climax. Krampus is a jolly good deviation from the traditional December offerings at the multiplex. It may not be for all tastes, but it is entertaining, well-executed, and unlike anything you’ll see this holiday season.